Ever since coming to Boston I’ve been frustrated by the inconsistency of the reception for NPR stations in the Boston area. Our apartment is wretchedly fickle about letting us get solid reception of WBUR or WGBH. 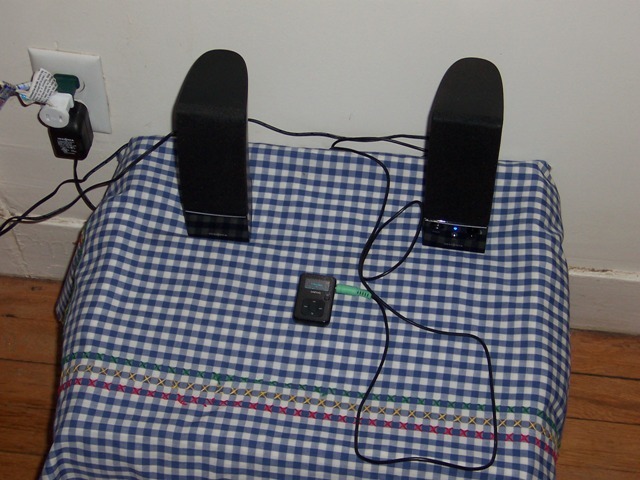 But yesterday, Hanna had a brainstorm to hook up her Sansa MP3 player (which gets really good radio reception in our apartment) to a pair of computer speakers which we aren’t currently using — and voila! A 21st century radio! We were just in time to hear the Sunday Puzzle on Morning Edition. Now I have NPR in the apartment and I am happy. My girlfriend is awesome.